Another year, another Souper Bowl from Branny Boils Over! Last year her effort yielded much success, and she’s looking to go even further this year. Click here for more details on how you can be a part of this great cause. 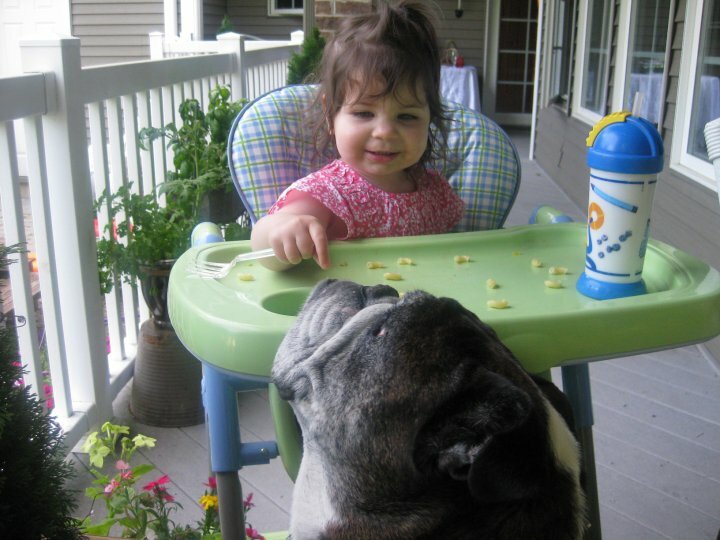 Last year I made my crockpot lentil soup for the event, and honored my sister’s English Bulldog, Vito…my first nephew. 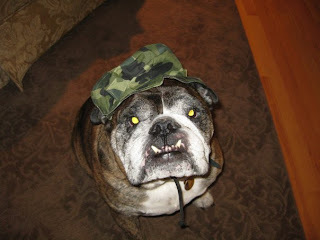 Seeing as he is the only pet in our family, I planned on doing the same this time around. Unfortunately, circumstances have changed since I made my soup last week…otherwise it definitely would have included lots of meatballs. On Sunday, January 15th, at around 10pm, Vito crossed to the other side and joined many other animals that we’ve loved in the past. For a while now, the V-Man hasn’t been in the best of health, and the past few weeks were really, really awful. My sister and brother-in-law did all that they could, but his time had come. He was 13 years old. The most handsome 13 year old I’ve ever known. 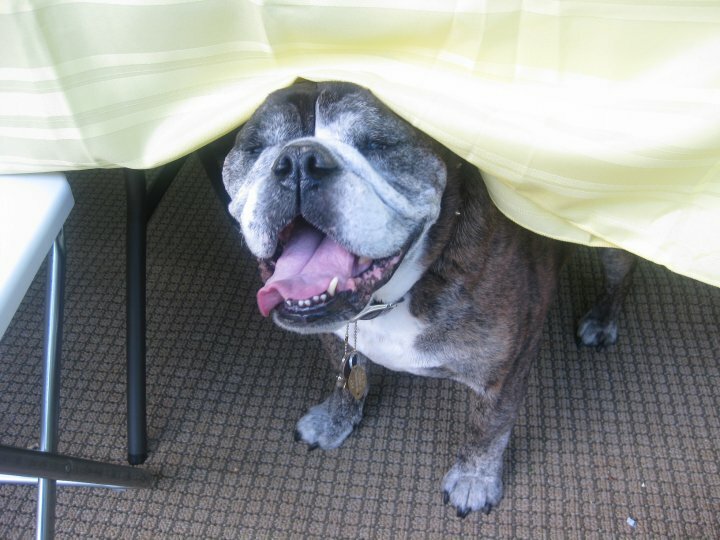 Vito was a HUGE part of our entire family. There have been lots of tears in the past few days but we all can smile and think of many, many fond memories of Vee Vee, as Bella called him. Cook garlic and beef in a large Dutch oven over medium heat until beef is no longer pink. Drain fat from pot. Stir in cabbage, water, rice, worcestershire, garlic powder, basil and peppers. Bring to a boil. Reduce to a simmer and cook, covered, for about 25-30 minutes. Stir in crushed tomatoes and salt. If at this point you feel it isn’t “soupy” enough for you, add more water and adjust seasonings to taste. Heat through. Serve with grated cheese, if desired. This entry was posted in beef, main dishes, QuickAndEasy, rice, soup, tomatoes. Bookmark the permalink. This is a beautiful dedication to Vito from his Aunt Miss who he always held dear to his heart as a loving aunt and a great cook! Great post (and cause!) and I am so sorry to hear about Vito. When we lost our dog, someone sent the following poem to me and I found comfort in it. I hope your family finds peace and comfort in all the wonderful memories with him. Such a lovely way to honor a very important part of your family. Will think of Vee everytime I eat your delicious soup. They grab your heart and never let go. Aw, I am so sorry. RIP mr vito! What a handsome fellow! We’ve had many animals cross over, and are prepping for another one in the nearish future. 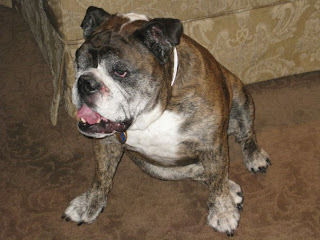 It is never easy, but it is obvious Vito had a fabulous, happy life! Oh I’m so sorry. It’s sad when animals pass :-(. I think I’d like to make this tonight, and maybe use lentils instead of meatballs – you think that would work? Steph, I think lentils would work…let me know if you try it! Oh and it isn’t meatballs in the dish – just ground beef. So sorry for your loss. So hard losing a beloved pet like that. I am definitely making this soup and if I do, and feature it on my blog, I’ll be sure to give you a shout-out. I adore stuffed cabbage and this makes life so much easier! Hi Melissa – I am very late to the game on the post. 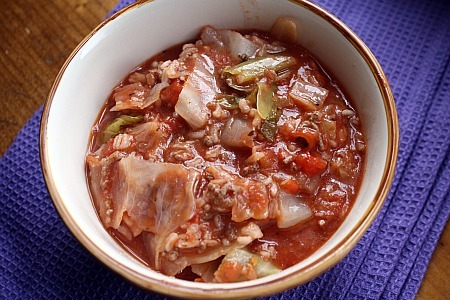 Just happened to be searching for stuffed cabbage soup recipes and was routed to your blog. But I still wanted to comment on the loss of Vito. We lost our beloved Weim (Riley) in June and now know firsthand the pain of losing a pet that is such a large part of the family. My heart goes out to you guys, even now 9 months after Vito’s passing. Almost 2 years later and I’m finally going to make this. I’ve had it pinned for forever!